The combination of surfing and yoga is not just about creating a relaxing end to a successful surf day, but also supports the regeneration of your body and improves your flexibility and balance on the surfboard. It does not matter if you travel alone or with friends because you will live a truly international experience. You will feel the good vibe of Casa Carmen, a surf house with ocean views. You will also enjoy a great experience in Fuerteventura that you will return home with interesting new friends and fantastic memories! Casa Carmen is a beautiful Canarian style villa that overlooks the ocean. Since the first moment you step into the house, you will feel the special charm of the house. Casa Carmen is located in Bristol area, one of the best places of Corralejo, Fuerteventura. It is a relaxed place where you will enjoy watching a sunset over the ocean from the backyard. The villa’s convenient location, only 5-minute walk to Corralejo town center, will allow you to walk to the beach, the supermarket, and restaurants. You can also go out for a drink at night with no need to take a taxi and even reach some of the best surf spots on the island at walking distance. The surf spots are the Bristol Wave, El Muelle, and Generoso or Rocky point. Surf courses are given for different levels, from beginner, intermediate to advanced surfers. Beginners are people who have never been surfing (or 1 day of experience). 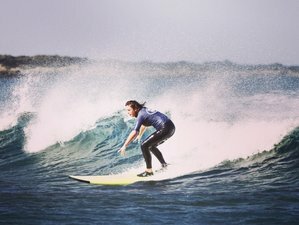 Intermediate surfers are people who have been surfing before but with less than 2 weeks of experience. Advanced surfers are people with more than 2 weeks of surf experience. Spanish and Surf focuses on a lot on giving individual corrections. Your progress in the school will determine your level. With Spanish and Surf’s mobile surf school, you will go surfing to several surf spots depending on the wind and the tide conditions. This will give you the opportunity to discover several beautiful and hidden spots of the island. Devoting a little time each day to practice yoga makes a difference. Yoga is by far one of the best things that you can do for yourself as it facilitates the task of achieving a higher balance between body and mind. Yoga boosts the regeneration of body cells and improves your flexibility remarkably after a few sessions of practice. In addition to this fact, surf in combination with yoga does not only help creating a relaxing end to a tough day, but also improves flexibility which has a direct impact on your surf skills when standing on the surfboard. Those who are in search of sea, sand, and sun will find paradise in Fuerteventura which has approximately 100 beaches. You don’t have to go to major touristic spots in order to find fantastic beaches since part of the island’s essence is numerous coves and smaller beaches with golden sand and calm waters. Even some of which are barely touched by man. This island boasts some of the finest coasts in the Atlantic with white or golden sandy beaches which disappear in a sea (literally) of turquoise water. Although most of them are found in the south of the island, mainly in the municipality of Pájara, wonderful beaches can be found all over Fuerteventura. Please book a flight to arrive at Fuerteventura Airport (FUE) where Spanish and Surf will pick you up at the airport. Transfer from and to the airport is included in the price. This surf and yoga camp is open all year round!